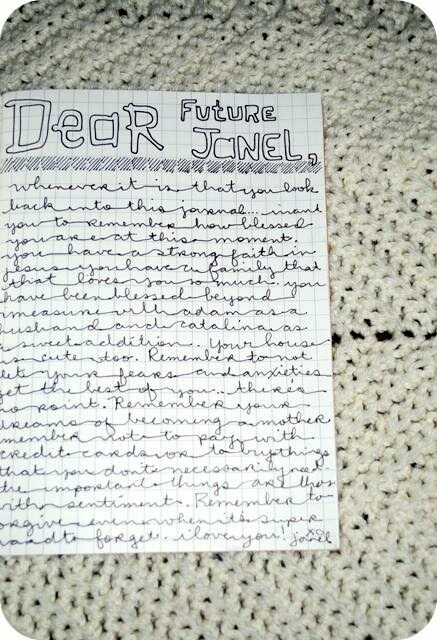 Journal Prompt 29: Today I want you to write a letter to either your past self, or your future self. What are some things that you wish you would have known in the past? What are some things that you want to remember in the future? Write yourself a love letter today!! I chose to write to my future self :) I wanted to have a reminder of all of the blessings that I have in my life and another reminder to focus on the positive blessings in my life as opposed to the fear and anxieties that I tend to dwell on :) There are also a few silly, yet important reminders for myself too, like no using credit cards and not buying things that we don't need :) Ok, I will be back tomorrow with our FINAL prompt! eeeek!! I'm a little sad it's over :( But I'm wayyyy behind, so I get a few days to enjoy it. I can't wait for the last prompt; you've made this so much fun, Janel. Thanks! lovelovelove this prompt. cant wait to do it!!! I can't believe it's gonna be over! so sad! ;'(. Your handwriting's awesome, by the way. Oh boy, I can´t believe that this is almost over, just one more day and 30 DJ is over. I´m so amazed that I have done it - OK one day not done yet LOL - I really thought I would not finish. But it´s been so much fun and I really want to thank you Janel, for all that you have made me think of:) You ROCK. i love this one :) i'm really glad the prompts will be up on your blog because i need more TIME!!! lol!!! (*@&*^#!*(@! * ahh! ps, i miss youuuu skype soon!!!!!!!!! Thanks for all the prompts :) Loved it. I'm a fairly new blog reader of yours. This sounds fun, and I'd love to help out a bit with the adoption. So, i'll join! I'm a fairly new blog reader of yours. 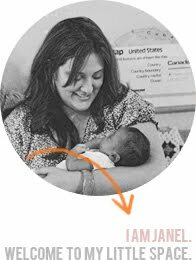 this sounds fun, and I'd love to help support your adoption.I'll join!